The Casio EX-H10 is a good travel zoom camera, offering a compelling package of compact dimensions, versatile wide-angle lens, large LCD screen and HD movies, but ultimately it comes up short in several key areas when compared to the Panasonic DMC-TZ7 / TZ6. The EX-H10 may officially be the slimmest camera in its class, but there's not really that much difference to its main competitors in terms of size or weight in reality. The 24-240mm lens is incredibly versatile, but not quite as much as the TZ7's 12x 25-300mm lens. The LCD screen is appealingly large, but suffers from a rather average resolution of 230,000 dots, while the HD movie mode is hamstrung by a 10 minute time limit, large file sizes, average sound quality and most importantly the inability to use the optical zoom lens during filming. Image quality is satisfactory rather than outstanding, with noise and loss of detail at relatively slow ISO speeds, limited maximum shutter speed of 4 seconds and a disappointing macro mode. This isn't the camera to buy if you're looking for the best ever image quality, but it does produce well-exposed and accurate photos that will please the majority of its target audience. Battery life is the main standout highlight, with the Casio EX-H10 easily capable of shooting between 750-1,000 shots on a single charge, depending upon how much in-camera reviewing you do. This is much better than all the H10's rivals, so it's a great choice if you don't have easy access to a power outlet during a prolonged trip away. 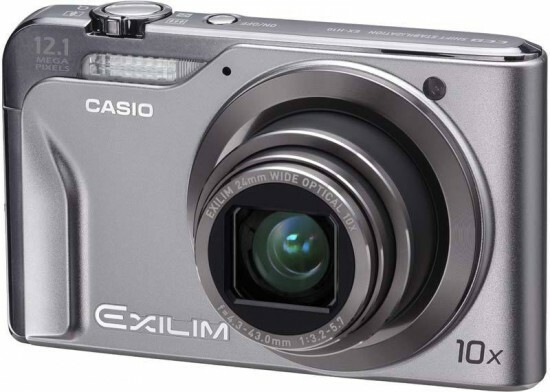 But even that wouldn't persuade us to choose the Casio EX-H10 ahead of the Panasonic DMC-TZ7 / TZ6 cameras. Casio's first entry into the ever more competitive travel-zoom segment is a solid offering that won't disappoint, but it can't quite match its main rivals.